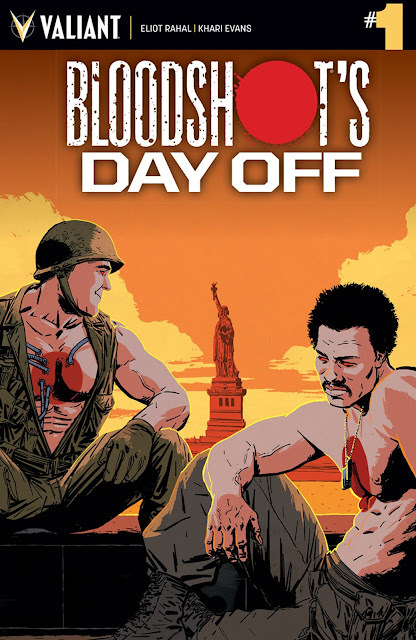 On a very special one-shot of 'Bloodshot’s Day Off,' Valiant takes a step back to pay homage to military veterans through the eyes of their super soldiers who get a day off in New York. Their one day to rest allows them to reflect on their past and in doing so, remind us the sacrifices they and their loved ones have made to protect this country. It's a thoughtful and heartfelt issue that makes it indeed special. Codenamed "Tank Man" (Winston Grover) and "Viet Man" (Dell Palmer), two nanite-induced soldiers finally get a chance for some downtime after 30 years of changing the course of history as enhanced human weapons of war. But before they can jettison their post for a whole 24 hours of whatever, they have to have an exit interview. Eliot Rahal takes this opportunity to cleverly and quickly retelling of the history of the Bloodshot Program and the Project Rising Spirit. It's a great primer for new readers and a brief trip down memory lane for long-time fans of Bloodshot. Rahal presents a striking picture of two different soldiers who came to the Bloodshot Program in different ways. Their individual stories are interwoven between their present day excursions with flashbacks of how they became soldiers then super soldiers. Winston begins his day with a vintage car rental listening to a golden oldie station reminiscing about what he gave up during World War II. Dell returns to Harlem and his house of worship just as Winston went to his. He visits with a loved one he thought he had lost a long time ago. It's an emotional journey for both that parallel each other in some ways and then the two reconvene at the end. They come to an understanding about each other and newfound respect for the human inside these enhanced bodies. This story is emblematic of real life soldiers who found their way into the military, sacrificed a lot, and were changed forever. It's a tribute to them that they're humanized in this way and in the end, find fellowship among other veterans. They are bound forever by a shared experience, a traumatic history, and memories of those they lost along the way. This may be a comic but 'Bloodshot's Day Off'' exposes some real issues that underneath the courage and discipline of our men and women in uniform lies a human being whose scars aren't always on the surface. Khari Evans is a phenomenal artist that excels with action and a Bloodshot comic is guaranteed to have plenty of it. This one is no different as demonstrated by the blood display of warfare and its consequences. Evans is a maestro with the layouts and the detailed penciling brings a gritty realism from the sculpted physiques to the crowded city streets. Andrew Dalhouse as the colorist finds the right tones to enliven each scene. None of the art would matter if they didn't capture the emotional turmoil in the characters' body language and face. Luckily, they nail both the action scenes and the quiet sullen moments as well. 'Bloodshot's Day Off' is a special one-shot that pays tribute to our veterans by humanizing their experience. The pain of sacrificing oneself for the greater good and leaving behind loved ones is an accessible theme that mirrors real life. Rahal and Evans take these superpowered killing machines and peel back the layers of their soul and reveal them to be very much human. You won't see these characters the same way ever again and that's why this book is highly recommended.